Heat rash pictures - What does heat rash look like in babies? 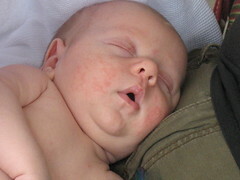 On this page with heat rash pictures new moms can see what a heat rash looks like. What is the best way to treat a heat rash and when you need to call a doctor? Why are babies more prone to this kind of skin rash? Heat rash is a skin irritation caused by too much sweating in hot and humid weather. The body cools itself by sweating. But sometimes the body temperature rises very quick and sweating is not enough to cool the body. Especially newborn babies have more difficulty regulating their body temperature. Heat rash or Miliaria Rubra occurs when the sweat glands get blocked by dead skin or bacteria. Another disadvantage for babies is that they have underdeveloped sweat glands. This makes them even more susceptible to developing a heat rash. What does heat rash look like in babies? Heat rash can look like lots of small red pimples all over a baby's body. Sometimes they form little blisters. Some people call it prickly heat because of the prickly and itchy rash. How do you know it is a heat rash and not another skin condition like eczema? Heat rash occurs in places where your baby sweats most, in skin folds like elbow creases, armpits, neck and upper chest and in the groin. Heat rash - Close up. Heat rash can be considered a warning sign that your baby is overheated. A very high body temperature is dangerous because it can damage brain and vital organs. This can also happen in the winter in cold weather when your baby is overdressed and sweating excessively. Learn how to treat heat rash in babies? Over heating in a baby's sleep can cause SIDS. Prefer dressing your baby in cotton pajamas and keep the nursery at a comfortable temperature, not too hot. Skin problems caused by the sun.